Free woodworking plans for shop jigs and other useful wookshop tools. Jig making not only makes your job easier, but it also improves your skills. 10 Free Woodworking Plans found in the "Shop Jigs" Category. 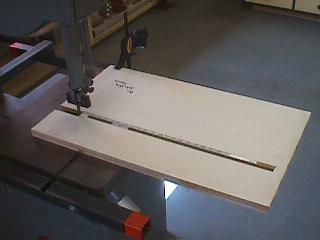 A simple adjustable shelf drilling jig for the shop. 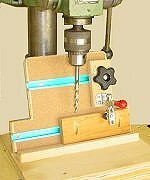 This is a useful jig for everyone's shop. What a great idea for a sanding station. Although this plan is for a Dewalt finish sander, I'm sure that it could be adapted to any type of sander imaginable. The pocket hole joint is one of the easiet joints to make. This joint is much faster and simpler than dowel joints because you only drill the hole in one of the pieces you need to join. You simply apply some glue, clamp the pieces together, and insert the screw. Not only is this an interesting plan, but it is also an interesting story. If you don't know what a spill plane is, check out this free woodworking plan to find out more. This is a perfect and free plan that will add to anyone's shop. This plan from Bob's plans is very detailed and it will take you step by step through the build of this project. Newsletter Enter your email address below to be added to our monthly newsletter update.